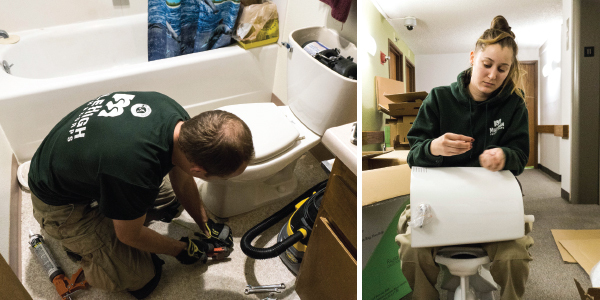 Mile High Youth Corps (MHYC) hires and trains young people to install and retrofit low-income homes with energy-efficient devices like low-flow showerheads, high-efficiency toilets, fluorescent light bulbs, and more! This program helps Mercy Housing properties conserve resources while teaching the next generation of community leaders responsibility, environmental stewardship, and is an opportunity to give back to the community. This organization continues to do great work across our Colorado homes, and we look forward to continuing our partnership! Mercy Housing and MHYC installed low-flow toilets, showerheads, and aerators in bathrooms and kitchens at 5 properties. With an estimated total rebate value of $64,000 offered by Denver Water, these water efficiency upgrades were installed at no cost to the Mercy Housing properties. These properties have saved more than 4 million gallons of water and saved more than $45,000 on water bills and additional savings on reduced hot water heating.